Tickets will go on sale in less than a month for an event the Ottawa Citizen called the Number-One Spot beyond Bavaria to celebrate Oktoberfest: the 2012 edition of Beau’s All Natural Brewing Company’s signature fundraising event, Vankleek Hill Oktoberfest. 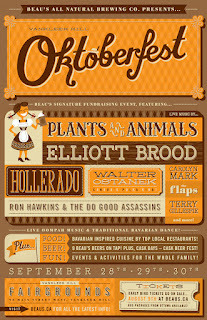 Starting August 9 earlybird tickets can be purchased online at www.beaus.ca for the three-day Bavarian-themed celebration of craft beer, local food and independent musicians. Like last year, the first 1,000 tickets sold will come with a CD compilation of the musicians who will be performing at this year’s festival. 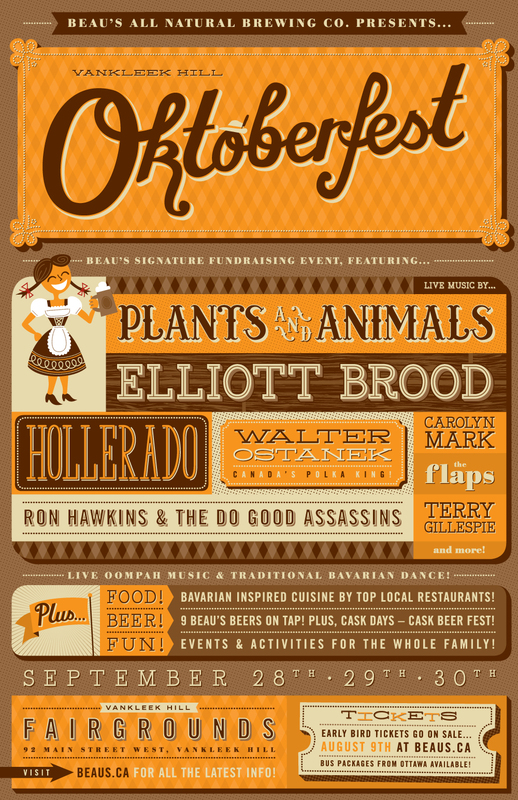 The Vankleek Hill Oktoberfest will take place Friday September 28, Saturday September 29, and Sunday September 30. Friday features extended hours (until 11 pm) this year to showcase music talent from alt-country act Elliot Brood and Juno nominees Hollerado; Saturday’s headliner is the Polaris- and Juno-nominated indie rock band Plants and Animals, and the revered Toronto musician Ron Hawkins. Canada’s polka king Walter Ostenak returns for Sunday’s festivities as well — the complete list of musicians will be announced when earlybird tickets go on sale in August. This year’s selected charities are Ottawa-based food system advocates Justfood (www.justfood.ca); Ottawa's homeless youth charity Operation Come Home (www.operationcomehome.ca); and the Vankleek Hill Agricultural Society. Last year's event raised more than $60,000 for charity, put little green alpine hats on 12,000 happy heads, and more than 46,000 steins of beer were served. New this year will be a beer-filled dunk tank for added merriment, and a midway with interactive games and challenges. Foodie alert: Bavarian and seasonally inspired food will be once again prominent and plentiful at this year’s event, with more than 20 Ottawa and Eastern Ontario-based restaurants serving up unique creations. Nine different Beau’s beers will flow from the draught taps at the festival, most of which were created exclusively for this event. New this year, a mixed 6-pack of the 2012 Beau’s Oktoberfest beers to take home and enjoy will be available for purchase at the brewery during Oktoberfest. To add to the beer selection, Cask Days returns this year with one-off, unique casks of beer from a variety of craft breweries from across Ontario and Quebec. For those who want to learn more about craft beer, food pairing, and evaluating beer styles, a Speaker Series and homebrew competition will be taking place onsite. "I'm really excited for this year's Oktoberfest,"says Beau's co-founder Steve Beauchesne. "The music, food, beer, dancing and games are all going to be amazing, and we have such a good, fun crowd out. It's so nice to get to see all of our friends enjoying themselves and coming back each year." Earlybird tickets will go on sale online beginning Thursday August 9. A single day pass for adults is $18, or one can save $9 on daily admission by purchasing a three-day pass for $45. Youth admission (18 or younger) is $5. Bus rides (roundtrip from Ottawa to Vankleek Hill and back) will be available again this year, and can be added on to each ticket for a extra fee. For those looking to be part of all the behind-the-scenes fun, admission to Oktoberfest is free for “Volun-beers” who can lend a hand and help out. Sign up online at www.beaus.ca/volunteer.